5.1. More registered voters are confident they can influence local vs. national decision-makers. Perceptions of collective efficacy regarding global warming – the belief that like-minded citizens can work together to influence action on global warming – is an important motivator for individuals to take collective action.Bandura, A. (2000). Exercise of human agency through collective efficacy. Current Directions in Psychological Science, 9, 75-78. doi:10.1111/1467-8721.00064/ Half of registered voters are at least “moderately confident” that people like them, working together, can affect what local businesses (51%) and/or their local government (50%) do about global warming. Fewer are confident that people can affect what their state government (46%), corporations (39%), and/or the federal government (38%) do about global warming. 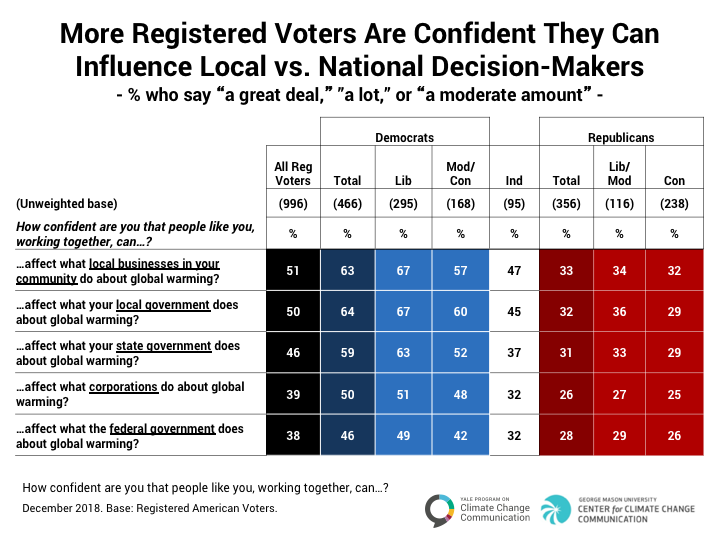 Democrats are more likely than Independents or Republicans to express confidence that people can affect what governments and businesses do about global warming. 5.2. 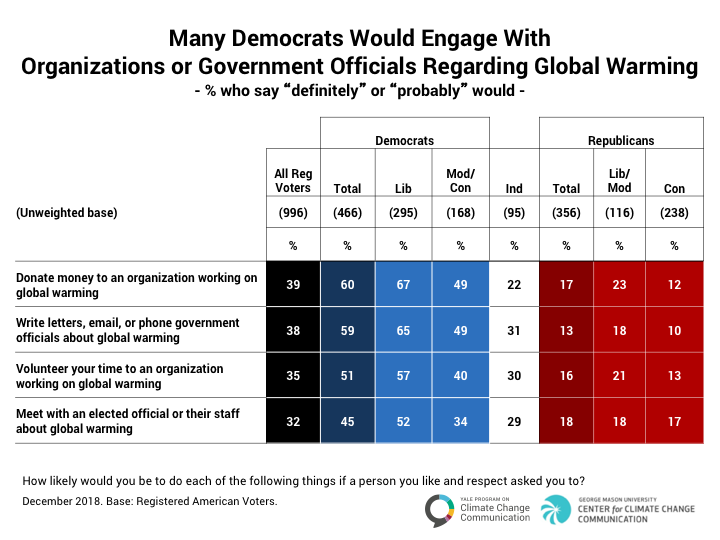 Many Democrats say they would engage with organizations and government officials regarding global warming. One in three or more registered voters say they would engage in organized efforts to address global warming, including donating money to an organization working on global warming (39%), writing letters, email, phoning government officials about global warming (38%), volunteering their time to an organization working on global warming (35%), or meeting with elected officials or their staff about global warming (32%). Democrats are more likely than Independents and Republicans to say they would take these actions. 5.3. Few registered voters have urged an elected official to take action to reduce global warming during the past 12 months. One in four liberal Democrats have done so. 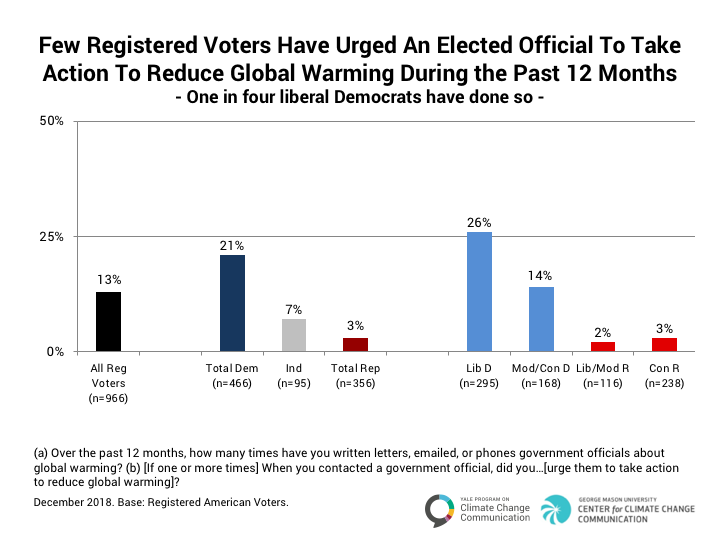 Only about one in eight registered voters (13%) say they have contacted an elected official during the past 12 months to urge them to take action to reduce global warming. However, 21% of Democrats, including 26% of liberal Democrats, and 14% of moderate/conservative Democrats say they have done so. Only 7% of Independents and 3% of Republicans say they have done so. 5.4. About one in three voters would join, or are already participating in, a campaign to convince elected officials to take action to reduce global warming. 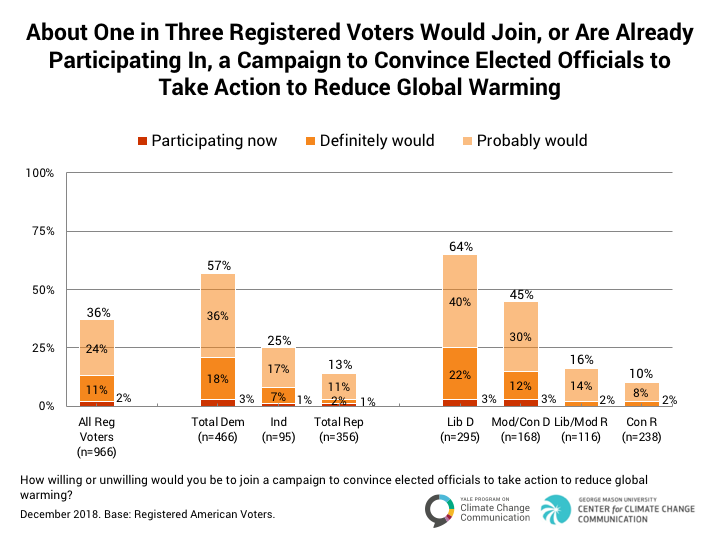 About one in three registered voters (36%) are participating (2%), definitely would participate (11%), or probably would participate (24%) in a campaign to convince elected officials to take action to reduce global warming. This includes more than half (57%) of Democrats (64% of liberal Democrats and 45% of moderate/conservative Democrats), one in four Independents (25%), and 13% of Republicans (16% of liberal/moderate Republicans and 10% of conservative Republicans).